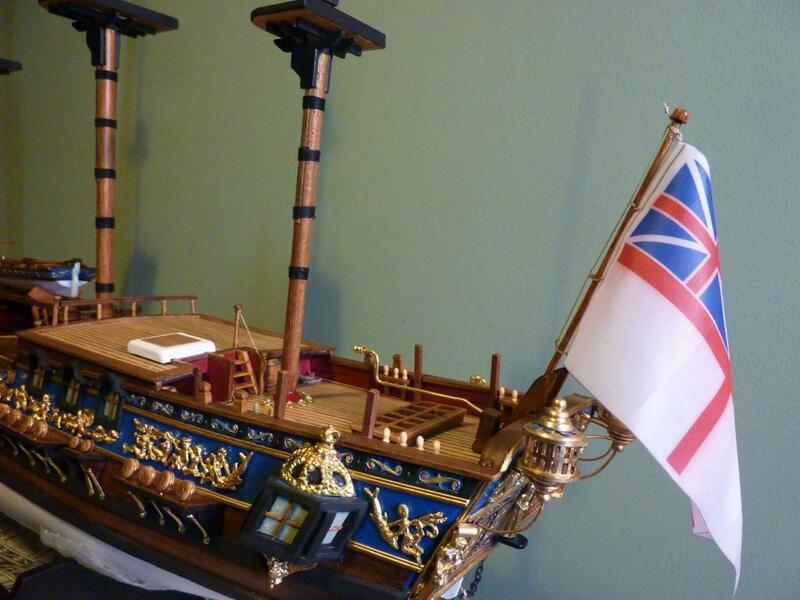 This is the British yacht, “Royal Caroline (1749)”, a 1:47 scale wooden ship, from Panart. Some of you may recall previous postings of this ship in earlier phases. An intermittent project, revisited for a week or so every few months, it’s always been impractical to post it as a WIP because its seriously occasional nature would drain momentum from the work for anyone following its progress. Instead, on previous occasions I’ve simply posted Headlines photos of it as I completed principal parts of the build. Now, after two years (seventeen working weeks, practically speaking), I’ve now reached the end of the construction phase. The spars are completed too, but as they’re suspended from the masts with the rigging, they’ll appear in due course. 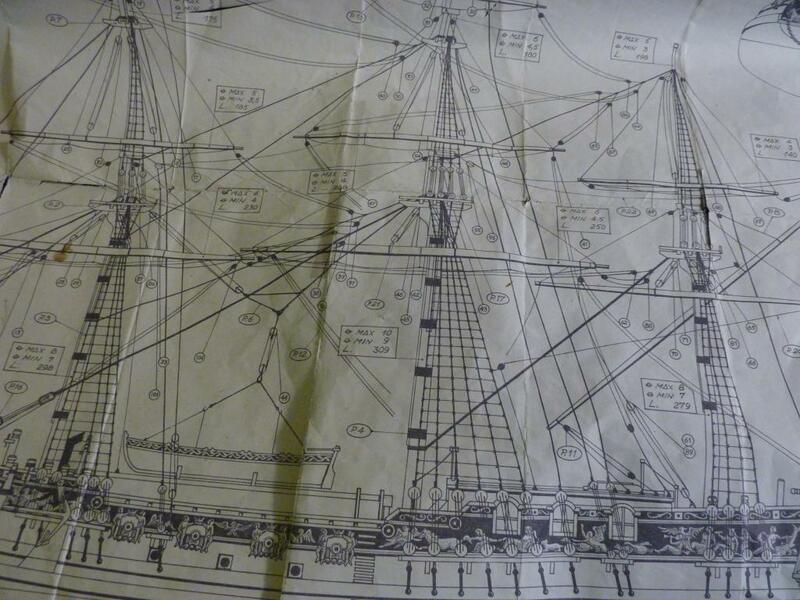 As you can see from one of the rigging plans here, to state that ‘all that’s left is the rigging’ is certainly an understatement and, from my experience of the build to date, somewhat naïve. Hopefully, the next time I post, it will be with the project completed. Hi Paul. Yes rigging is complex and more so when you look at the various dead eyes, pulley blocks and rat lines to be sorted. I can see why you might have approached this as a part time build Rob. I definitely would have burned out on this. Are the sails to be unfurled? Cheers, Al. No sails as these ships traditionally shown rigged only, but I know Mantua have a set available for anyone interested in that route. I’m sticking with the cat’s cradle look. This is another WINNER!!! I like the small detail very much. Can’t wait to see her kitted out in full sail. Thanks Morne. Alas, no sails (see comment to Al). Indeed. I consider it progress when something I thought would take a month gets done in 3 weeks. Totally agree with Bob. This build would outlast my attention span! Great work Rob. A daunting undertaking, Rob….something I certainly wouldn’t wanna tackle. She’s gonna be a beauty, though. Thanks, Craig. Yes I agree – not everyone’s cup of tea. As I’ve said on earlier occasions, I’m no model shipwright, just trying to get through it with a few shreds of modelling dignity still in place. 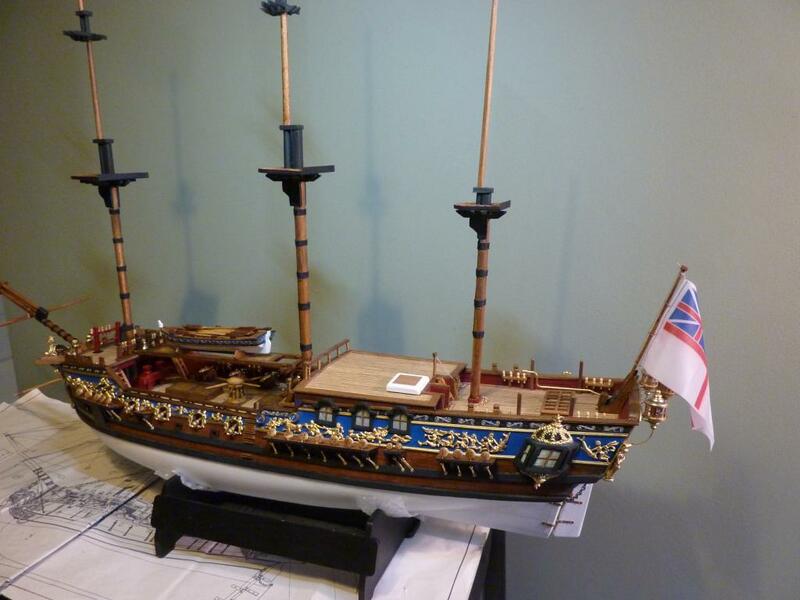 Love the build Rob, trying to finish off a Billings HMS Victory, bit of a large challenge (rigging) you know what I mean. Cheers, Steve. I think the Billings’ Victory is 1:75 scale? So, half the size of the Caroline. I met a guy at an engineering exhibition who was scratch building the Victory in a huge scale. He was using a book that had all the original ship’s plans! I would say it was going to be easily 2m in length. Your right Rob it’s 1/75 and yes it’s rather large, not quite sure were I’ll be able to display it when it’s finished. I’ll have to get permission from she who must be obeyed as to were it will go. But I have the book Victory the anatomy of the ship it’s got every drawing and plans I’ll ever need including all the rigging drawings so fingers crossed. Steve. The art of modelling, love it ! Can t wait to see more, beautiful details ! I will not complain about rigging after seeing those plans Rob. Yes since this build I never think twice about rigging WW1 kits. Impressive stuff, Rob. Takes me back to the early eighties when I tackled the Billings Boats Norske Love. After many, many months I finally got over the line, but I think I’d rather climb Everest that take on a task like that again. But your patience is clearly being rewarded, and I look forward to seeing the finished model. Yes a real teeth-gritter at times, but maybe something unusual and decorative in the end; we’ll see. 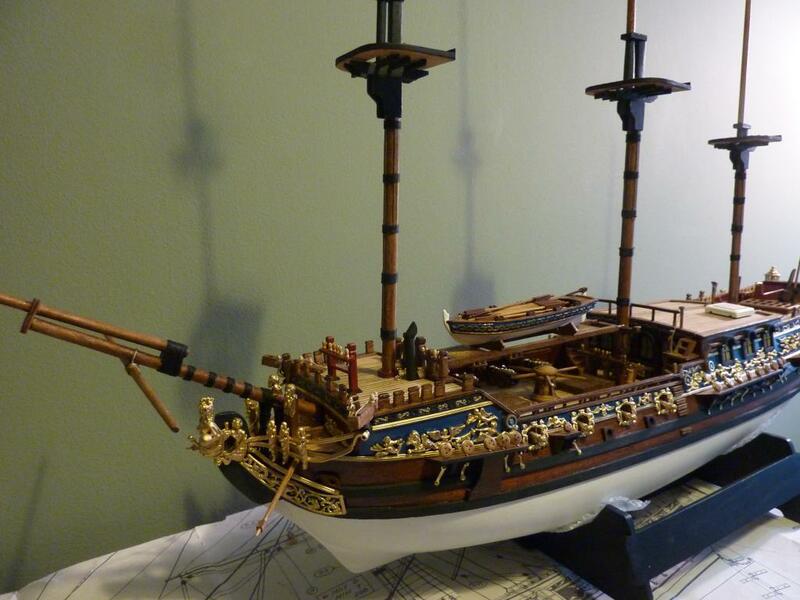 Some good old fashioned ship modelling! 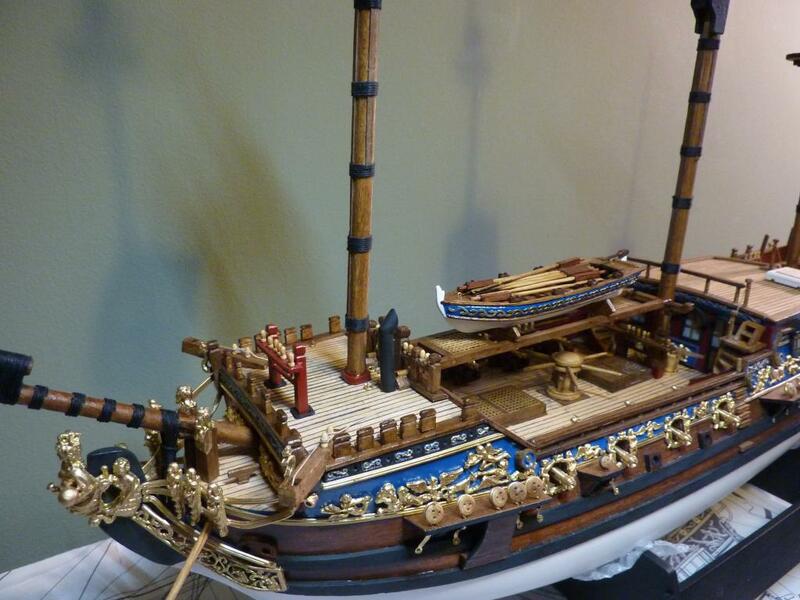 I’ve never built a sailing ship myself, but i love looking at such models. Keep working on the rigging step by step and you will eventually make it. I think Ulf is right, step by step is the key, and that seems to be how you’ve tackled this build so far, so I’m sure you’ll complete it. I also agree with Al, the colours are beautiful. Cheers, George. I’ve gone away from traditional finishes a little. The red, blue, and white are all as call outs, but I decided to use three different shades of acrylic varnish – walnut, dark oak, and beech – to give the various wood finishes some depth rather than just a plain coat of sealer. Really beautiful Rob. I can see why it took so long. I have a Q? Does the rigging that goes up the sides of the masts come semi built? The ones with all the ladder work. I saw on Micro Mark that they have a jig for making these. Just wondering. Great build! Thanks, Steve. Nothing is presented in a modular fashion. Everything is built up from strips of larch and walnut (hull is double-skinned), and the different rope types are given on spools. I’m aware of the jig you mentioned but haven’t got one. Wow! Inch by inch, step by step…….amazing work! Thanks, Jeff. Inch by inch is really the only choice with this sort of thing. If you have trouble doing all that rigging I think Micromark sells trained spiders that can spin standing rigging for most ships of the line. 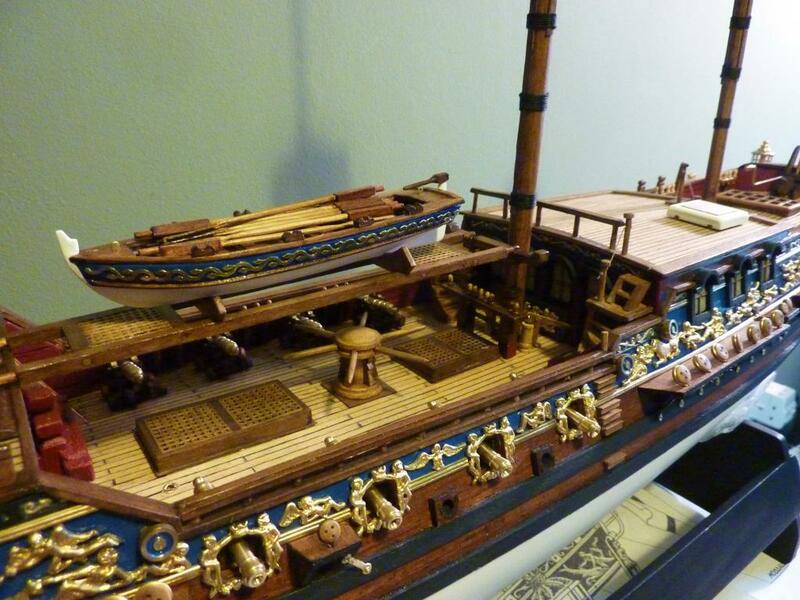 Really great job on the hull and detail (small boat and fancy work). Do you plan to furl the sails? No sails here, although a set is available separately for those who might prefer them. I mentioned above I was staying with the cat’s cradle look. Beautiful Rob, love the rich colors and filigree. The rigging plan looks daunting. 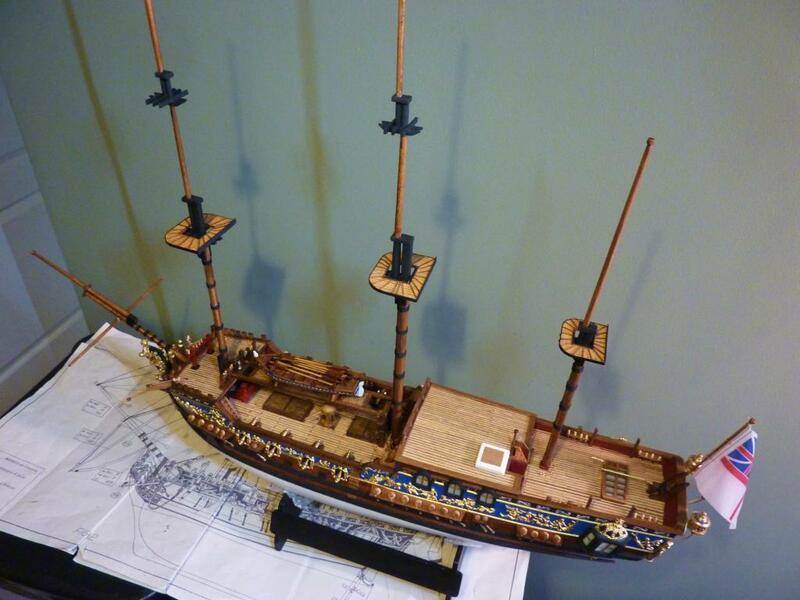 How do you plan to install the rigging, fore to aft, inside to out, or rig each mast individually? Looking forward to your “final” installment. Thanks for looking in, Rick. 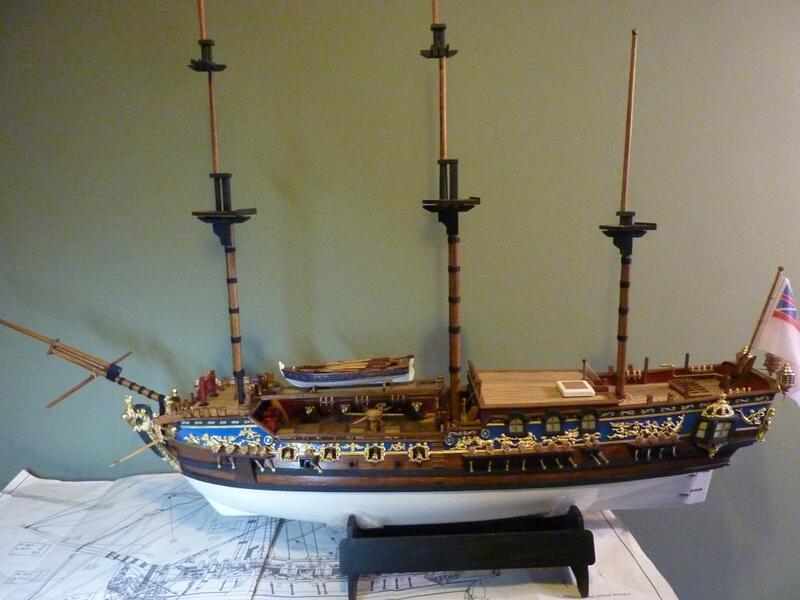 I’ve started with the mizzenmast (rearmost). I think I’ve probably done about 75% of it in five days. 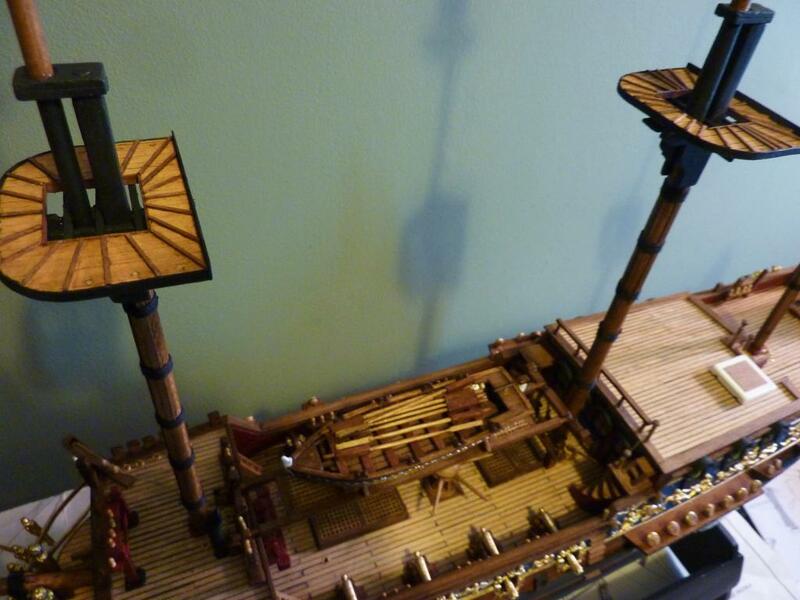 Presently working on the rope ladders (ratlines), which have a complex system of vertical ropes fixed between the top of the mast and a double set up of deadyeyes at deck rail level, and the vertical ropes are then set with horizontal ropes to form the ladder effect. These horizontal lines are fixed with a clove hitch and have to be kept square and level. It’s like doing surgery sutures.